A must have for every wardrobe are stud earrings. I know how hard it can be to find the perfect stud earrings so I would like to introduce you to Anjolee. Anjolee allows you to customize every design with your choice of yellow gold, white gold, or platinum. Below are some of their bestselling studs – all customizable just for you. Anjolee’s Classic Four Prong Diamond Studs are perfect for everyday wear! They never go out of style and add the perfect finishing touch to any outfit. These Gemstone Stud Earrings are available with Amethyst, Citrine, Garnet, Peridot, Ruby, Sapphire, Tanzanite, or Topaz. It is a great way to add a little color and the diamond halo is gorgeous. 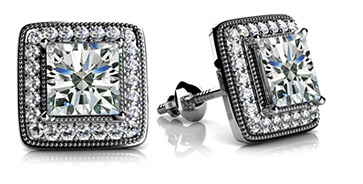 These Princess Cut Diamond Studs are gorgeous. They are a great way to dress up any outfit and add luxury to anyone’s style. In addition to their earrings, Anjolee also offers engagement rings, bridal sets, anniversary rings, necklaces, and bracelets. Check them out today at Anjolee.com. The gemstone studs are absolutely amazing <3 Great post! I do not trust this company if they cannot keep their word to a blogger collaboration that means they unworthy to customers.